Canvas matches its course enrollments with myFSU Student Central Sunday through Friday at: 5:00am, 7:00am, 9:00am, 11:00am, 1:00pm, 3:00pm, 5:00pm, 7:00pm, and 9:00pm. If a course schedule change occurs an hour before any of these "enrollment cycles", it may take an additional enrollment cycle for the change to take effect. Instructors, you can skip down here. Generally speaking, you will be allowed access to the Canvas courses that you are registered for 10 days before the start of the semester. If you are unable to access your Canvas course within 10 days of the start of the semester, then your instructor may not have published the course yet. Some instructors may prefer to only allow students to access their Canvas course on the first day of classes. Please note:There is a time delay between registering for your class in myFSU and then being enrolled in that Canvas course site. This means that if you have recently registered for your class in myFSU, then you will not be able to access it immediately in Canvas. You will only be able to access the course in Canvas after the next automated enrollment process has run--see the top of this article. You should have access to your courses by the end of the first week of class. If you don't, either the instructor is running behind and has not published the course, or the instructor has chosen not to use Canvas. In either of these cases, please contact your instructor if you have not already received instructions. 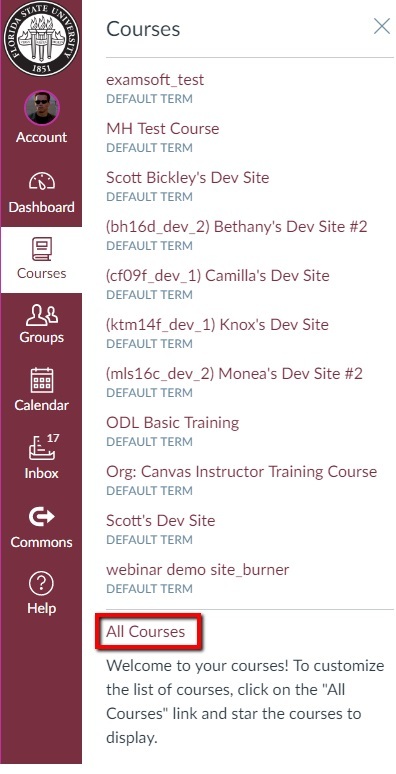 Your Canvas course will be listed under "Past Enrollments" on the All Courses page. It displays all Canvas courses that you have access to: currently active courses, courses from previous semesters, and archived courses. To access the All Courses page, select Courses in the garnet global navigation menu and then select All Courses. As a student, you will default to having read-only access to your course for up to a year after it ends. This means that you will be able to access the content, but you cannot submit anything. However, if you are unable to access your course at all after the term has ended, this means that your instructor has chosen to restrict course access to students after the course ended. If you need to re-submit work for any reason, please contact your instructor. Your Canvas sites are automatically created for you each semester and our enrollment scripts automatically enroll you into your Canvas courses. Regarding instructor course enrollments, please note: There is a time delay between being made official instructor of record with the registrar and being enrolled in your Canvas course site. Please allow up to 24 hours for your Canvas account to be enrolled into your course after you are officially made instructor of record. Students are allowed access to your sites 10 days before the start of the new semester. This means that if your course is published before the first day of classes, then your students will have access to any published items that you have not restricted with availability dates. As a result, students will be able to post to any discussions and submit assignments that are both published and do not have specified availability dates before the first day of class. However, students CANNOT submit any quizzes in your Canvas site until the semester start date. You can bypass this restriction by artificially moving up the course start date and clicking the override flag. Your students will also be able to access the People and Grades pages. If you do not want your students to know who else is enrolled in the class, you can opt to make the People page unavailable to students. If you do not want your students to have any access to your course site prior to the first day of class, then you will need to keep your course unpublished until the first day of class. Please keep in mind: There is a time delay between a student registering for your class in myFSU and that student being enrolled in your Canvas course site. This means that if one of your students has recently registered for your class in myFSU, then he or she will not appear immediately on the People page in your Canvas site. Students will only appear in your course after the next automated enrollment cycle has run--see the top of this article. You can completely customize what you see on your Dashboard at any time. If you would like a previous semester's course to continue to display on your Dashboard, simply locate this course on your All Courses page and select the star icon next to it to mark it as a "favorite." If you wish to hide any unwanted courses from your Dashboard they will remain in Courses > All Courses. You can also choose to prevent students from accessing your course content at all after the course has ended by checking the "restrict students from viewing course after end date" checkbox on the course settings page. How do I add a user to a course site after the term end date has passed? How do I manually enroll a user (e.g., TA, Course Designer, etc.) into my course site? I registered for my course, so why isn't it showing up?